Bouddhanath is among the largest stupas in South Asia, and it has become the focal point of Tibetan Buddhism in Nepal. The white mound looms thirty-six meters overhead. The stupa is located on the ancient trade route to Tibet, and Tibetan merchants rested and offered prayers here for many centuries. When refugees entered Nepal from Tibet in the 1950s, many of them decided to live around Bouddhanath. They established many gompas, and the "Little Tibet" of Nepal was born. This "Little Tibet" is still the best place in the Valley to observe Tibetan lifestyle. Monks walk about in maroon robes. Tibetans walk with prayer wheels in their hands, and the rituals of prostration are presented to the Buddha as worshippers circumambulate the stupa on their hands and knees, bowing down to their lord. Many people believe that Bouddhanath was constructed in the fifth century, but definite proof is lacking. The stupa is said to entomb the remains of a Kasyap sage who is venerable both to Buddhists and Hindus. One legend has it that a woman requested a Valley king for the donation of ground required to build a stupa. She said she needed land covered by one buffalo's skin and her wish was granted by the King. She cut a buffalo skin into thin strips and circled off a fairly large clearing. The king had no choice but to give her the land. The Bouddha area is a visual feast. Colorful thangkas, Tibetan jewellery, hand-woven carpets, masks, and khukuri knives are sold in the surrounding stalls. Smaller stupas are located at the base. Gompa monasteries, curio shops, and restaurants surround Bouddhanath. Conveniently situated restaurants with roof-top patios provide good food and excellent views of Bouddhanath. Dating as far back as 1696 A.D., this gate is guarded on either side by two huge statues of lions. Alongside, there are two stone images of Bhairav (the dreadful aspect of Shiva) and Ugrachandi (the consort of Shiva in her fearful manifestation). The Golden Gate is said to be the most beautiful and richly moulded specimen of its kind in the entire world. The door is surmounted by a figure of the goddess Kali and Garuda (the mythical man-bird) and attended by two heavenly nymphs. It is also embellished with mythical creatures of marvellous intricacy. In the words of Percy Brown, an eminent English art critic and historian, the Golden Gate is the most lovely piece of art in the whole Kingdom: it is placed like a jewel, flashing innumerable facets in the handsome setting of its surroundings. The gate was erected by King Ranjit Malla and is the entrance of the main courtyard of the Palace of Fifty-five Windows. This magnificent palace was built during the reign of King Yakshya Malla in A.D. 1427 and was subsequently remodelled by King Bhupatindra Malla in the seventeenth century. Among the brick walls with their gracious setting and sculptural design, is a balcony with Fifty-five Windows, considered to be a unique masterpiece of woodcarving. The Art Gallery contains ancient paintings belonging to the Hindu and Buddhist traditions of various periods and descriptions. This gallery is open everyday except Tuesday. This statue showing King Bhupatindra Malla in the act of worship is set on a column facing the palace. Of the square's many statues, this is considered to be the most magnificent. Swayambhu's light was covered in time because few could bear its intensity. By the thirteenth century, after many layers were added to the original structure that enveloped the Lord's power, a dome-like shape had been acquired. The stupas central mast was damaged and replaced at that time. Peripheral sources of power were discovered on the hilltop as well and stupas, temples, and rest houses were built to honour them. Images of important deities, both Buddhist and Hindu, were also installed. Today, age-old statues and shrines dot the stupa complex. Behind the hilltop is a temple dedicated to Manjusri or Saraswati - the goddess of learning. 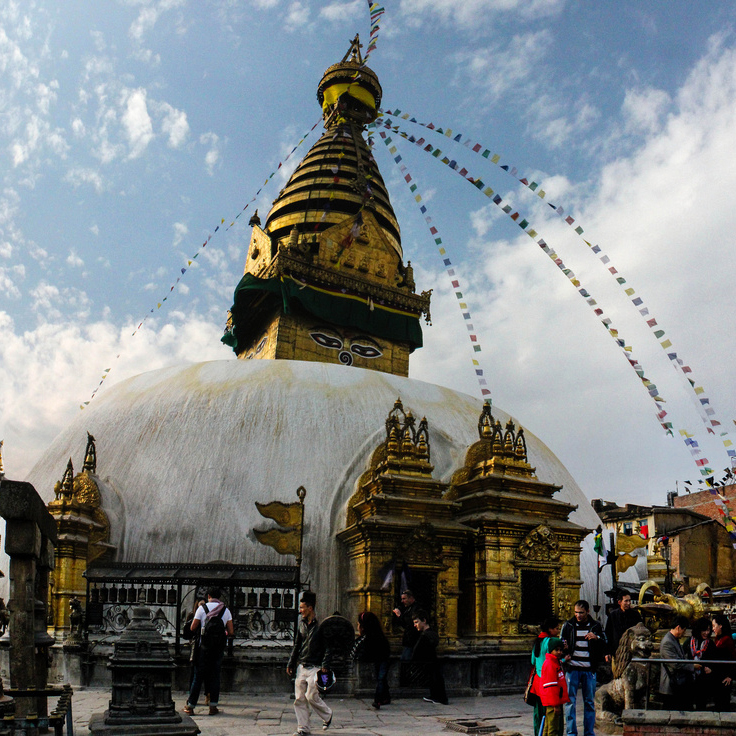 Swayambhu is, perhaps, the best place to observe the religious harmony in Nepal. 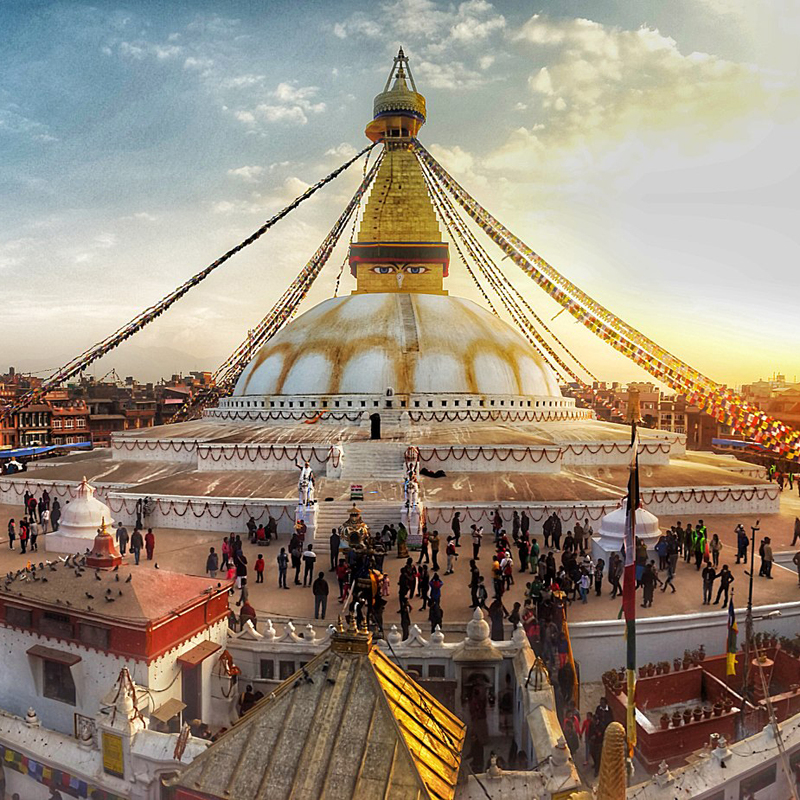 The stupa is among the most ancient in this part of the world, and its worshippers are diverse from Newar nuns, Tibetan monks, and Brahmin priests to lay Buddhists and Hindus. The largest image of the Sakyamuni Buddha in Nepal is in a monastery next to the stupa. Other monasteries here have huge prayer wheels, fine Buddhist paintings, and special butter lamps which may be lit after presenting monetary offerings. Swayambhu is a major landmark of the Valley and looks like a beacon below the Nagarjun hill. It provides an excellent view of the Kathmandu Valley. Devotees have climbed the steps on the eastern side for centuries. Statues of the Buddha, mini stupas, monasteries and monkeys make the climb to Swayambhu - which is fairly steep - worthwhile. But for someone who is pressed for time, the western road allows you to get off your transport almost at the base of the stupa. 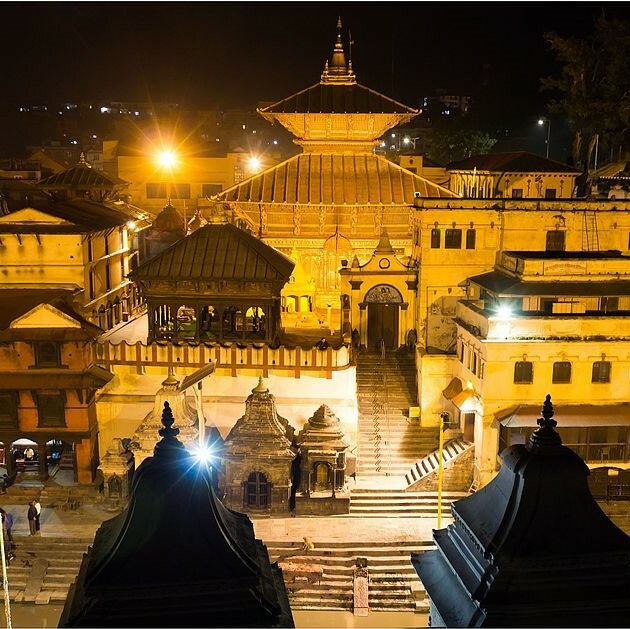 The Pashupatinath Temple is a famous and sacred Hindu temple complex that is located on the banks of the Bagmati River, approximately 5 kilometres north-east of Kathmandu in the eastern part of Kathmandu Valley, the capital of Nepal. 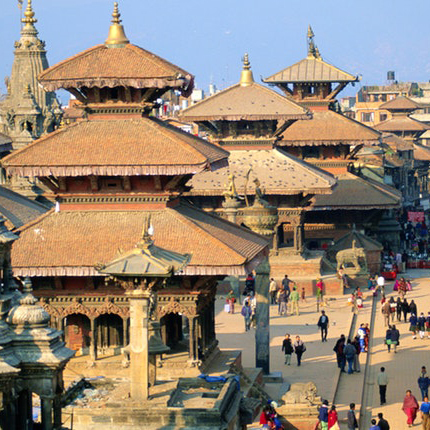 The temple serves as the seat of Nepal’s national deity, Lord Pashupatinath. This temple complex was inscribed on the UNESCO World Heritage Sites's list in 1979. This "extensive Hindu temple precinct" is a "sprawling collection of temples, ashrams, images and inscriptions raised over the centuries along the banks of the sacred Bagmati river" and is included as one of the seven monument groups in UNESCO's designation of Kathmandu Valley as a cultural heritage site. One of the major Festivals of the temple is Maha Shivaratri on which day over 1 million devotees visit here. 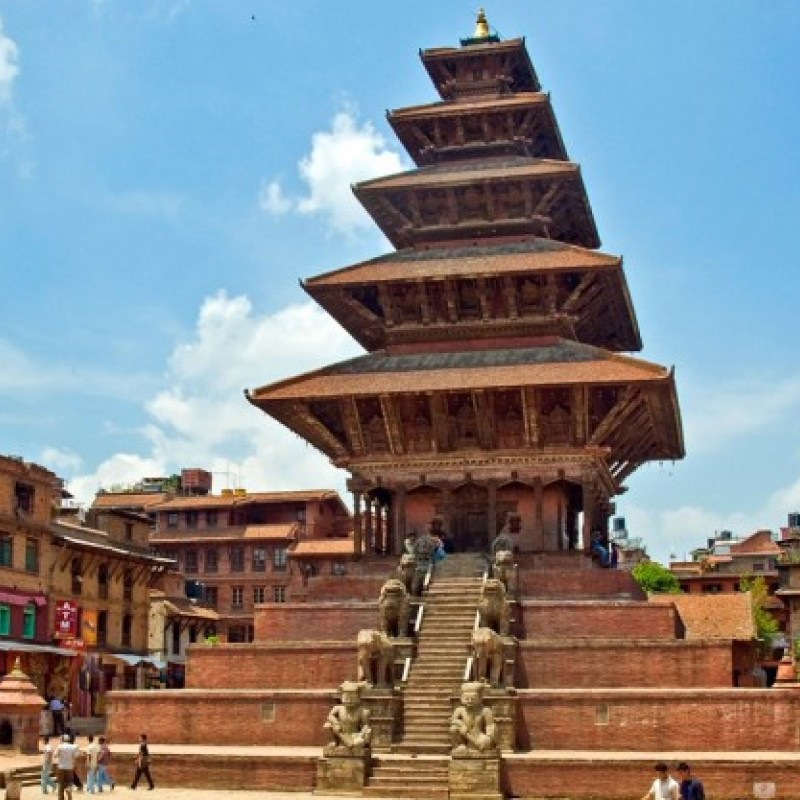 Kathmandu Durbar Square (Basantapur Durbar Kshetra) in front of the old royal palace of the former Kathmandu Kingdom is one of three Durbar (royal palace) Squares in the Kathmandu Valley in Nepal, all of which are UNESCO World Heritage Sites. 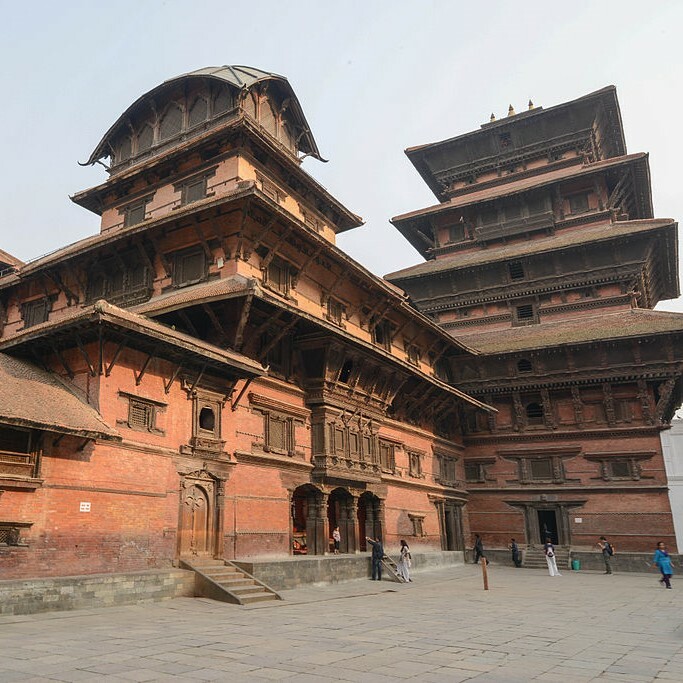 Basantapur is the home of Newars.